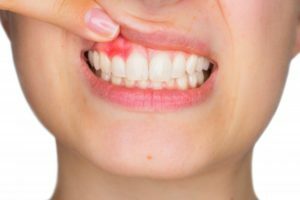 Do your gums ever get red or swollen? Or, maybe they bleed when you’re brushing or flossing? There are many possible causes, but very often, inflamed gums are a warning sign of oral and overall health problems. Tender or red gums can also tip off poor oral health maintenance. Keep reading to learn why your gums may be inflamed, and why the health of your gums is important. Why Are My Gums Red or Swollen? Gingivitis: The first stage of gum disease causes inflammation of your gums. Aggressive brushing: Brushing too hard or using hard-bristled brushes can cause gum inflammation. Lack of flossing: If you don’t floss regularly, your gums will be sensitive when you do start. This can cause pain and bleeding. Ill-fitting dentures: If you have dentures that don’t fit well, they can rub and shift on your gums, causing inflammation. Medications: Certain medications like blood thinners can make you susceptible to bleeding gums. While all of these causes are valid, the most common is gingivitis (the start of gum disease). This disease is caused by poor brushing and flossing. If plaque isn’t removed from your smile, it can buildup underneath your gumline, separating your gums from your teeth. This leads to tender gums, bleeding, and inflammation. Gum disease, if left untreated, can lead to bone and tooth loss. It is also linked with serious overall health issues like cardiovascular disease, stroke, and diabetes. That’s why it’s vital to take red or puffy gums seriously. If it’s gingivitis, your gum disease can be reversed and eliminated through good oral healthcare and routine dental visits. However, if you let it persist, gum disease can permanently damage your teeth and surrounding tissue. How Can I Help My Gums? If you notice bleeding gums, tenderness, puffy or red gums, or sensitivity, contact your dentist right away. They will be able to properly diagnose the cause and provide the right treatment. What’s most important is that you maintain a good oral healthcare routine at home. Brushing and flossing daily will keep your gums strong and healthy. Just make sure to use a soft-bristled toothbrush. Think of brushing your teeth as a massage for your pearly whites instead of scrubbing to avoid damaging your gums. You can also use mouthwash as a finishing touch to keep your mouth clean and refreshed. Use these tips to keep your gums healthy and prevent more serious issues from occurring. If you notice any changes in the look or feel of your gums, contact your dentist right away. A graduate of the Boston University Goldman School of Dental Medicine, Dr. Gabriel Ruiz is a highly-trained dentist with a passion for quality care. He believes in patient education, which is why he wants you to know the importance of the health of your gums. He currently practices at East Brunswick Family & Implant Dentistry, and he can be contacted through is website or by phone at (732) 238-6660 for any questions.